The splashback is the panel behind the kitchen stove or sink that protects the wall from water, cooking liquids and fumes. Many people choose to have the splashback made from tiles or stone, and design it to suit the kitchen décor. The idea behind a splashback is simple and practical, but like any tiling projects we need to take the right approach in order to ensure the best result. The tiles of a splashback should affixed to a cement board. This needs to be secure and exactly level. If you wish to avoid cutting any tiles you can simply build the splashback to suit the tile dimensions. Protect any kitchen benchtops with heavy sheeting. Canvas is ideal. Use a large fluid level (several feet wide) to make sure the splashback is level. Use this to make sure the first row of tiles (at the base) are level. This help when aligning subsequent rows of tiles. Fix any alignment problem as soon as you notice it. You cannot compensate by moving other tiles because the flaw will be easy to spot. Once all the tiles are in and have set you will need to apply grout. This is a little different to floor grout because the wall it vertical and not horizontal like a floor. YouTube has some videos on the subject. Because the splashback is only of moderate size it is a good opportunity to use pre-mixed grout. This will give a consistent colour without careful mixing. The grout will set in about 30 minutes, check the label. When this occurs, wipe the tiles with a wet sponge to remove excess grout. Keep washing the sponge in clean water. Apply silicon around the edges. Modern tiles are strong, robust and relatively inexpensive because of mass production techniques. 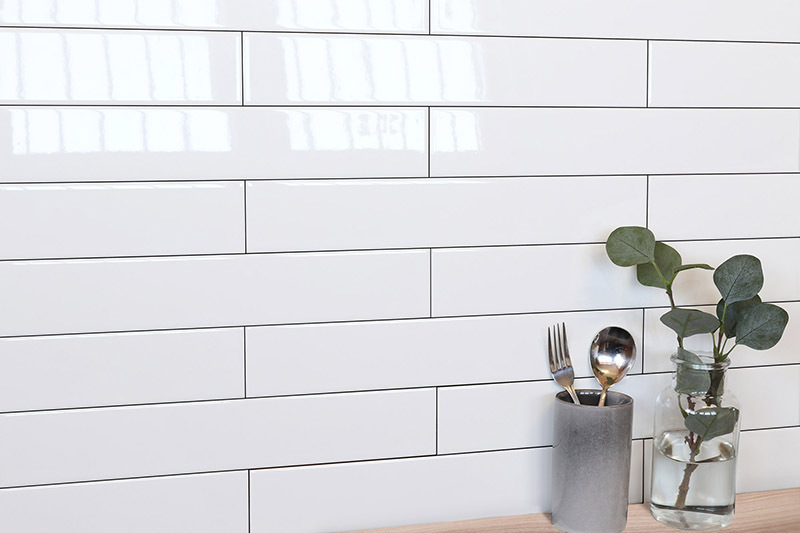 There are countless tile designs, so there is something suitable for any kitchen.